(Nanowerk News) Associate Professor Ki-Bum Lee has developed patent-pending technology that may overcome one of the critical barriers to harnessing the full therapeutic potential of stem cells. One of the major challenges facing researchers interested in regenerating cells and growing new tissue to treat debilitating injuries and diseases such as Parkinson’s disease, heart disease, and spinal cord trauma, is creating an easy, effective, and non-toxic methodology to control differentiation into specific cell lineages. Lee and colleagues at Rutgers and Kyoto University in Japan have invented a platform they call NanoScript, an important breakthrough for researchers in the area of gene expression. Gene expression is the way information encoded in a gene is used to direct the assembly of a protein molecule, which is integral to the process of tissue development through stem cell therapeutics. Stem cells hold great promise for a wide range of medical therapeutics as they have the ability to grow tissue throughout the body. In many tissues, stem cells have an almost limitless ability to divide and replenish other cells, serving as an internal repair system. Transcription factor (TF) proteins are master regulators of gene expression. TF proteins play a pivotal role in regulating stem cell differentiation. Although some have tried to make synthetic molecules that perform the functions of natural transcription factors, NanoScript is the first nanomaterial TF protein that can interact with endogenous DNA. 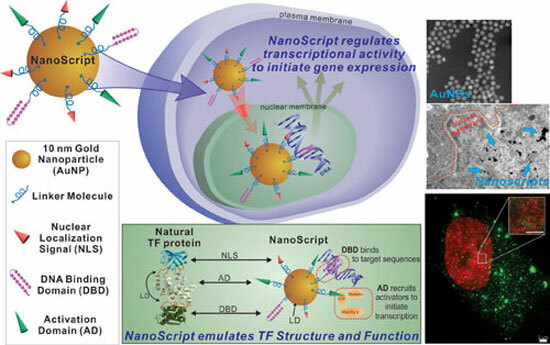 ACS Nano, a publication of the American Chemical Society (ACS), has published Lee’s research on NanoScript ("NanoScript: A Nanoparticle-Based Artificial Transcription Factor for Effective Gene Regulation"). The research is supported by a grant from the National Institutes of Health (NIH). NanoScript was constructed by tethering functional peptides and small molecules called synthetic transcription factors, which mimic the individual TF domains, onto gold nanoparticles. Lee said the next step for his research is to study what happens to the gold nanoparticles after NanoScript is utilized, to ensure no toxic effects arise, and to ensure the effectiveness of NanoScript over long periods of time. Lee, originally from South Korea, joined the Rutgers faculty in 2008 and has earned many honors including the NIH Director’s New Innovator Award. Lee received his Ph.D. in Chemistry from Northwestern University where he studied with Professor Chad. A. Mirkin, a pioneer in the coupling of nanotechnology and biomolecules. Lee completed his postdoctoral training at The Scripps Research Institute with Professor Peter G. Schultz. Lee has served as a Visiting Scholar at both Princeton University and UCLA Medical School. The primary interest of Lee’s group is to develop and integrate nanotechnologies and chemical functional genomics to modulate signaling pathways in mammalian cells towards specific cell lineages or behaviors. He has published more than 50 articles and filed for 17 corresponding patents.